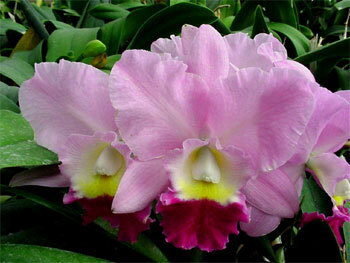 You can cultivate your orchids with other houseplants in any part of the house where plants generally do well. Choose a southerly or easterly window, preferably with a gauze or lace curtain so that you can allow more or less light as the seasons change. Grow your orchids on a tray filled with pebbles. Keep water in the tray to provide your plants with the constant humidity that they need, but don't keep the water level higher than the level of the pebbles. Water plants a minimum of once a week by allowing water to run for a minute through the porous soil medium. Be careful not to leave the roots submerged in water, as this can lead to a fungal condition known as "root rot". Mist your orchids daily with room-temperature water. Never let the temperature around your orchids to drop below 45 degrees F. Promote good air movement and prevent cold drafts. You may move your orchids outside during the summer months if you introduce them gradually over a period of a few weeks. Some orchids enjoy a certain amount of direct sunlight, while others tolerate very little. Extended periods of direct sun should be avoided when the temperature is high. Cattleyas are some of the most commonly grown orchid plants, and their culture is often used as the basis for comparison with other types of orchids. The flowers in cattleyas and their related hybrids come in most all colors of the spectrum. Culture varies only slightly among most of these groups; this cultural information is a general guide to "standard" Cattleya culture. Like most other cultivated orchids, cattleyas are epiphytic, or air plants. Because they are epiphytic, they have developed water-storage organs, called pseudobulbs, and have large, fleshy roots covered with a spongy, water-retentive velamen. They are accustomed to being dry at the roots between waterings, and therefore should be potted in very porous, free-draining media. Light: is one of the most important factors in growing and blooming cattleyas, whether in a greenhouse setting or in the home. Bright light to some sun must be given to the plants, but no direct sun in the middle of the day. This means an east, shaded-south (as with a sheer curtain), or west window in the home, and 30% to 50% of full sun in a greenhouse (3000 to 5000 foot-candles). Leaves should be a medium green color. Temperatures: Recommended temperatures are 55°-60°F at night and 70°-85°F during the day. Seedlings should have night temperatures 5° to 10° higher. A 10-20 degree differential between day and night is recom- mended, especially for mature plants. Higher day temperatures can be tolerated (up to 95°), if humidity, air circulation, and shading are increased. Water: should be provided in two ways: in the pot by watering and in the air as humidity. Watering in the pot is dictated by many criteria--size and type of pot, temperature, light, etc. Mature cattleyas need to dry out thoroughly before being watered again. Seedlings need slightly more constant moisture. Compare the weight of a dry pot of the same size and type of medium; it can indicate if a plant needs water. A freshly sharpened pencil inserted in the potting medium can be an indicator of moisture. If in doubt, it's best to wait a day or two until watering. Plants in active growth need more water than plants that are resting. Water below 50° may injure plants, as will softened water. Humidity: Cattleyas need 50 % to 80 % relative humidity. This can be provided in the home by placing the plants on trays of gravel, partially filled with water so that the plants stand above the water. Misting the plants in the morning only is helpful in dry climates. Air should always be moving around the plants to prevent fungal or bacterial diseases, especially if high humidity and/or cool temperatures exist. In the greenhouse the humidity can be increased by wetting the floor. Evaporative cooling increases humidity while cooling the air. Fertilizer: must be given to cattleyas on a regular schedule. In fir bark, a high-nitrogen (30-10-10) formula- tion, or a similar proportion, is used. High-phosphorus or bloom-booster (10-30-20) formulation may be used occasionally (every 4 to 6 applications) to make sturdy growths and promote healthy blooming. When in active growth, plants need fertilizer every two weeks, and when not growing, once a month. Fertilizer can also be applied with every watering at 1/4 recommended dilution. Thorough flushing with clear water every month is recommended to prevent buildup of fertilizer salts. Potting: Potting is necessary when 1) the rhizome of the plants protrudes over the edge of the pot, or 2) the potting medium starts to break down and drain poorly (usually after 2 to 3 years). It is best to repot 1) just before new roots sprout from the rhizome, 2) after flowering, or 3) in the springtime. Cattleyas are usually potted in medium-grade potting material, with seedlings in fine-grade. Until a plant has six mature pseudobulbs, it generally should be put into a larger pot and not divided. If dividing a plant 3 to 5 bulbs per division are required. Select a pot that will allow for 2 to 3 years of growth before crowding the pot. Place a small cone of potting material in the bottom of the pot, cut off any rotten roots, and spread the firm, live roots over the cone. Fill the pot with medium, working it in the roots. Pack firmly; stake if necessary. Keep the plant humid, shaded, and dry at the roots for a while to promote new root growth. A vitamin B-l solution may help re-establish plants quickly. Unlike many cultivated orchids, cymbidiums are semi-terrestrial plants. They have a growth period in the summer, needing 60 to 85 degrees F, medium to high light, ample fertilizer, and a moist potting medium. Cool fall nights (to 40 degrees), "bloom-booster" fertilizer, or no fertilizer. All induce flowering. They should be planted in fir bark/peat moss. Miniature cymbidiums can stand temperatures of 5 to 10 degrees higher. Light: Strong summer sun is important. Bright indirect light in winter. Give half filtered to full sun (in cool climates) in the summer; a bright window in the home or greenhouse in the winer. Temperature: Cymbidiums must have cool nights, especially in the fall, to encourage flowering. Cymbidiums can stand hot summer days up to 95 degrees if shading, humidity and air circulation are increased. Give night temperatures of 45 to 60 degrees; day temperatures of 65 to 85 degrees. Water: Spray with water when plants are outside to keep them cool. Mist in home in a.m. to raise humidity. Avoid misting flowers. Give water copiously enough to keep moist in summer. Water just enough to keep leaves from drying in winter. Fertilizer: Must be provided on a regular basis since potting media have little. In summer, give 30-10-10 once a week at recommended rates. In early fall, use 10-30-20 bloom booster until flower spikes appear. Use a balanced fertilizer once a month in the winter. Temperature & Humidity: Vandas are basically warm growers. Daytime temperature should range from 65 to 95 degrees; nighttime from 60 to 65 degrees. It is important to provide good humidity, especially on warm sunny days. Light & Shade: It is important to give Vandas a high degree of light. Terete leaf Vandas can adapt to full sun while strap leaf types do better with some protection during the mid-day hours. We do not recommend Vandas for artificial light culture as there is not enough light intensity for successful blooming. If Vandas are grown in the home, a bright south exposre is best. Watering: During the spring and summer months when Vandas are kept outdoors in bright warm areas, frequent watering is needed. Vandas shoud not be kept dry or moist over an extended period. Misting on warm sunny days is very beneficial. Feeding: Vandas require a rather constant feeding during the spring and summer months. We recommend a balanced fertilizer (18-18-18) for best results. When feeding with every watering, a half-strength or less solution is best. Potting: A coarse grade of potting material is best suited for Vandas. Chunks of coarse bark or tree fern mixed with a general orcid mix will do well. Redwood baskets or slotted clay pots are ideal containers for Vandas. As Vandas become larger, they tend to get somewhat leggy. As the roots develop on the upper portion of the plant, you may remove the upper half and repot it as a separate plant. After this is done, the lower portion generaly develops offshoots. When these offshoots develop roots, they too, may be removed and repotted on their own. Masdevallia, a genus of some 350 species usually from cool, misty mountains of the New World tropics, is known for its showy flowers with sepals striking in their size, shape, and/or color. Their need for a cool, damp environment makes them an excellent choice for cool coastal climates. Temperatures should be cool to intermediate; plants will grow slowly and eventually expire if temperatures remain high for long periods of time. Cool evenings help reduce heat stress during the day. Nights of 50 to 55 degrees F are ideal; day temperatures should be 60 to 75 degrees. Evaporative cooling pads or humidifiers are useful in maintaining these conditions. Light levels for this group usually are thought of as fairly low; however, some successful growers believe that the best flowerings are produced under higher light levels. Plants can be grown, but not necessarily flowered, in the same light levels as those for ferns--400 to 1000 foot-candles. Most growers maintain levels adequate for Phalaenopsis and Paphiopedilum--1000 to 1500 foot-candles. Masdevallias can be kept in light intensities up to 2500 foot-candles if the growing area can be kept cool. Plants grow well under four-tube fluorescent fixtures and can be summered outside in the shade. Water is critical for these plants because they have minimal water storage tissue. Roots should be allowed to become just dry before watering again; if drainage is adequate, constantly moist roots are fine. Fertilizer should be applied regularly while plants are actively growing. Applications of 30-10-10 type formulations twice a month are ideal for plants in a bark-based medium. A 20-20-20 type formulation should be used for plants in other media. If weather is dull, applications once a month are sufficient. Some growers use a high phosphorus, 10-30-20 type formulation ("bloom booster") as plants approach flowering. Potting is best done in the winter or early spring, before the heat of summer and/or as new roots are produced. Plants must be repotted frequently, every one or two years, to keep the potting mix from decomposing. A fine-grade potting medium, such as fine fir bark or tree fern fiber, is often used with plastic pots. Sphagnum is also used, especially for establishing plants. The bottom third or quarter of the pot should be filled with drainage material, either broken crock, rocks, or Styrofoam "peanuts." The plant should be positioned in the pot so that the newest growth is farthest from the edge of the pot, allowing the maximum number of new growths without crowding the pot. Plants growing in many directions may be positioned in the center of the pot. Spread the roots over a cone of potting medium and fill in around the roots with potting medium to the junction of the roots and the plant. Firm the medium around the roots by applying pressure. Keep humidity high and the potting medium slightly dry until new roots form. A vitamin B-1 compound may help establish newly potted plants. Masdevallias are best grown under cool to intermediate conditions in the greenhouse or home. Most species and hybrids are compact enough that they can be easily accommodated on window sills or under lights. The well-draining potting medium should not be allowed to dry out completely. Fertilizer: Must be provided on a regular basis, about every other week. Give 30-10-10 for bark mix formulations and 20-20-20 for other potting media. Concentration should be half of what the label recommends. Paphiopedilums, or slipper orchids to some, originate from the jungles of the Far East and Indonesia. They are semi-terrestrial, growing in humus and other material on the forest floor, on cliffs in pockets, and occasionally in trees. They're easy to grow in the home, under lights, or in the greenhouse. Light is easier to provide for "paphs", as we will call them, than many other types of orchids. They like shady conditions, as in the home in an east or west window, or near a shaded south window. In the greenhouse, heavy shade must be provided--giving them about 1000 to 1500 foot-candles. They are often grown under the bench, provided precautions are taken to prevent rot. Fluorescent light is excellent; use 2 or 4 tubes just over the leaves. Water must be available at the plant's roots constantly, since they have no pseudobulbs, and therefore store most of their water in their leaves. They need a moist medium--never soggy, but never dry. Water once or twice a week. Humidity for paphs should be moderate, between 40% and 50%, which can be maintained in the home by setting the plants on trays of gravel, partially filled with water, so that the plants never sit in water. In dry climates, misting (in the morning only) can help increase humidity. In a greenhouse, average humidity is sufficient; spraying the floor or using an evaporative cooling system in warm climates can increase the humidity. Air movement is essential, especially when humidity is high. Temperatures for paphs range considerably. Many growers separate paphs into two goups, the warm-growing mottled-leaf types and the cool-growing, green-leaf types.Warm-growing types should be 60 to 65 degrees at night, and 75 to 85 degrees or more during the day. Cool-growing types should be 50 to 60 degrees at night; 75 to 80 degrees during the day. Many growers grow all plants in the same temperature range with excellent success. The plants can stand night temperatures in the 40s if necessary (as when grown outside in mild climates), as well as temperatures to 95 degrees. Care must be taken to protect the plants from rot when cold (keep humidity low, and do not let water stand on leaves or in the crowns of the plants), and also to protect from burning when hot, (shade more heavily and increase humidity and air movement ). Fertilizer must be applied on a regular schedule, but care must be taken to avoid burning of the fleshy, hairy roots. High-nitrgoen fertilizers (like 30-10-10) are recommended when potted in any fir bark mix. In warm weather, some growers use half-strength applications every two weeks; others use l/4 strength every watering. It's important to flush with clear water monthly to leach excess fertilizer, which can burn roots. In cool weather, fertilizer applications once a month are sufficient. Potting should be done about every two years, or as the medium decomposes. Seedlings are often repotted annually. Mixes vary tremendously; most are fine and/or medium-grade fir bark, with varying additives--perlite (sponge-rock), coarse sand, sphagnum peat moss, etc. Moisture retention with excellent drainage is needed. Divide large plants by pulling or cutting the fans of the leaves apart, into clumps of 3-5 growths. Smaller divisions will grow, but may not bloom as well. Spread the roots over a small amount of medium in the bottom of the pot and fill with medium, so that the junction of the roots and stem is buried 1/2" deep in the center of the pot. Do not overpot; an average plant should have a 4 - 6" pot. Unlike many cultivated orchids, paphiopedilums are semi-terrestrial plants. They are excellent house plants, needing only bright light or very little sun. They grow and flower well under artificial lights. Since they have no pseudobulbs, they need more constant moisture than other orchids, and resent too much fertilizer. Flowers are long-lasting. Light: Bright light is important; most windows are sufficient. Give bright light, but very little direct sun. In the home: an east, west, or shaded south window. In the greenhouse: 70% to 85% shade. Temperature: Two groups exist--grean-leaf and mottled-leaf. Mottled-leaved types should be about 10 degrees warmer at night than green-leaved plants. Give nights of 50 to 60 degrees.....days of 75 to 80 degrees. Water: Keep moist year round, letting only top layer of potting medium become dry. Keep pots on a tray of moist pebbles in home to increase humidity. A humidity of 40% to 50% is ideal. Water standing in leaves causes rot. Fertilizer: Must be provided only occasionally since roots are sensitive to excess. Give 30-10-10 if plants are in fir bark mixes; best at half strength every other week. Flush pots with clear water often to reduce fertilizer build-up. Less fertilizer is needed in winter. Once a month is usually sufficient.